Warm sunny weather? We love it…so do winter weeds. Cool nights and sunny, warm days are giving winter weeds the boost they need to be a real nuisance this spring. This is the time of year when you may, unknowingly, be allowing winter weeds to launch a full force attack on your spring lawn and landscape. The more they are allowed to grow now, the more they will spread as the weather warms up. By employing a bit of elbow grease now, pulling or killing the weeds starting to grow and spread, you’ll have a much easier time keeping your spring landscape looking its best. There are a few particular weeds you should be keeping a keen eye on right now, before they become a bigger problem. Henbit loves the cool, moist soil of winter, causing it to be a prolific grower in the cooler months. We’ve already begun to see it popping up in lawns and landscapes. Henbit can be identified by its upright, spreading habit with furry lower leaves. Plants produce tiny purple flowers at the ends of the stems in small whorls. After plants flower, they’ll spread more seed. Henbit can grow to 6-inches tall and up to 1-foot wide. 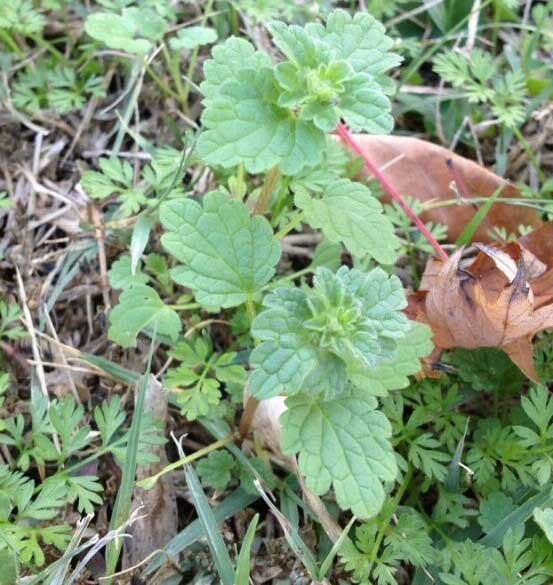 Henbit also loves to invade freshly seeded lawns that have yet to fill in, as well as dormant lawns. Bluegrass prefers the short day lengths and cool conditions we’re experiencing this month. If you have compacted soils then you most likely will see annual bluegrass begin to grow right now, especially if you tend to overwater. The moist heavy soils create a perfect conditions for bluegrass to thrive. Plants have a low growing, spreading habit and is often a lighter green than the rest of your lawn. They produce unsightly seedheads that germinate in late summer and early fall once soil temperatures fall below 70° F. The seeds germinate in fall and plants then overwinter in a vegetative state. Seeds can lie dormant in the soil for years before germinating, making annual bluegrass tough to eradicate completely. In summer, it may die back due to heat stress and summer pests. 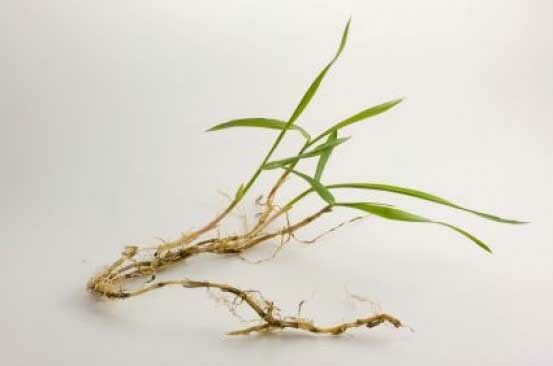 One of the most common weeds in our Dallas lawns is crabgrass. You’ll easily recognize it by its low growing, clumping manner with stems that extend out much like the legs of a crab. Crabgrass is typically a lighter green color than the rest of the lawn. The crabgrass you see in your lawns now is growing from seed dropped the previous spring and summer. Once temperatures reach 55°F, seeds will begin to germinate again. Right now, with the weather being as warm as it has been, don’t be surprised to see established plants growing quickly and new seedlings popping up in your lawn in the next few weeks. If your lawn is already weakened from compacted soil or improper irrigation, crabgrass can invade and take over quickly. Areas that are bare of grass or damaged by insects or disease can all be overrun by crabgrass. It can also come up in cracks in driveways and sidewalks. Your best defense against weeds is a thick, healthy lawn and a proactive approach to weed control. Healthy, bioactive soil will help grow a lawn with deep roots and a vigorous growth habit. The thicker and healthier your lawn, the better it outcompetes existing weeds and keeps new ones from putting down roots. Feeding both your soil and your lawn throughout the growing seasons will help keep it strong. Amending your soil with organic compost, earthworm castings and other soil conditioners will ensure good microbial activity and stabilize moisture content. Soil that holds water in summer and drains well in the cooler months grows stronger roots systems and creates a better environment for earthworms. Another approach you may consider, especially with things warming up so soon this year, is starting your spring mowing a bit earlier. If weeds are already cropping up in your lawn, you’ll need to keep them mowed so they don’t flower and drop more seed. Also, mowing a little early will allow sunshine to reach the soil, warming it up. This can encourage your dormant lawn to kick back into gear a bit earlier. Keep an eye out for weeds growing in your lawn. And stay tuned…we’ll be covering a detailed feature on how to properly mow in spring to reduce weeds in the coming weeks.